Mike grew up in Olathe, KS. He has been in the Harley business since March, 2012! 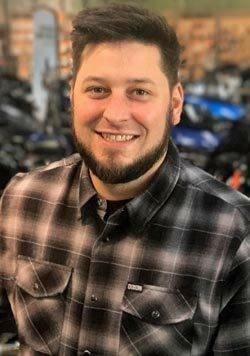 He was brought to the dealership by the friendly atmosphere and his love of motorcycles. 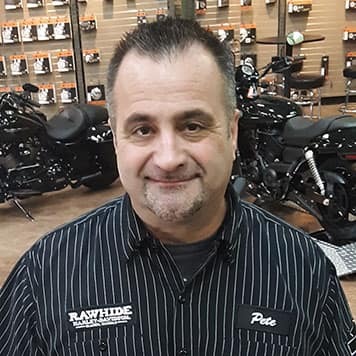 Pete comes to us from Blue Springs, MO and has spent 4.5 years in the Harley business. He rides an FLSS and a fun fact about him is that he lived in LA for 6 years! Dustin is from Adrian MO, He has 4 years in the Harley Business. He rides a Softail Deluxe. Fun fact is you can catch him on the mic at a karaoke bar. Mike is from Shawnee, KS. 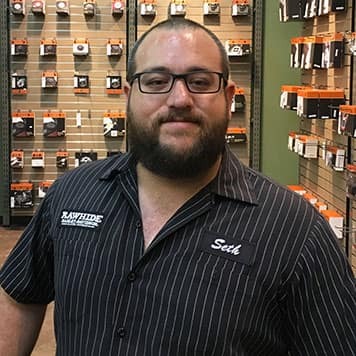 He has been in the Harley business for over eight years now. He’s been here so long he came with the building! His nick name is “Silver Fox” He was drawn to the dealership by the new philosophy of sales. Mike enjoys riding all the new bikes at the dealership. Alex ‘Big Brown’ comes from the Sin City, Las Vegas! He regards himself as charismatic and awesome, and came to us as a major career change. He is a Class A member PGA of America!! Brian comes from our neighbor across the way, Baseor, and is just getting his foot wet in the Harley Business. 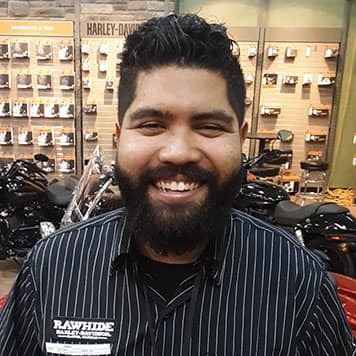 He rides a 2012 Yamaha V Star 1300 and wanted to work here because we are so much fun! 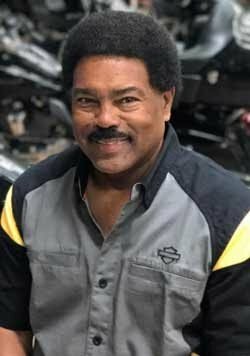 ‘Bud’ hails from the great state of Georgia, is always looking for something bigger and better, and rides a Street Glide. Seth comes from KCMO and he rides a 2005 Deluxe. 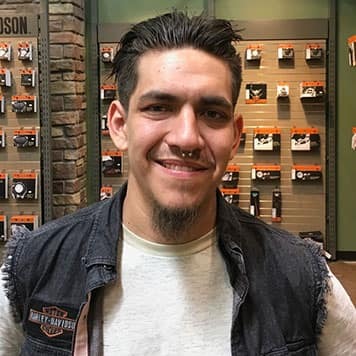 He is just starting out in the Harley Business and a fun fact about him is that he loves music! 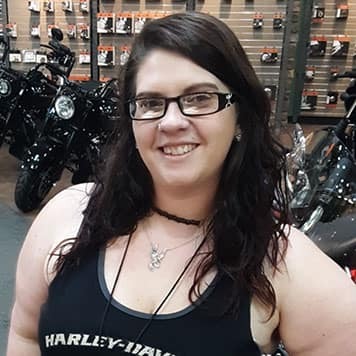 Christine, or ‘Tine’ comes to us from Beltsville, MD and has been in the Harley business for 5 years. She is here for a new beginning and her favorite bike is a Road King Special. Her favorite place is Disney World, and claims her 6 year old makes all the rules. Tevyanna AKA Tevy is from Shawnee Kansas. She is new to the Harley world, she is a little bit country with some rock n roll in her. At first she may seem shy, but once you get to know her she will be your best friend. She is very excited to not only learn about the Harley family but is excited to learn to ride as well. Seth grew up in Spring Hill, KS. Got into Harley Business for the love of motorcycles. 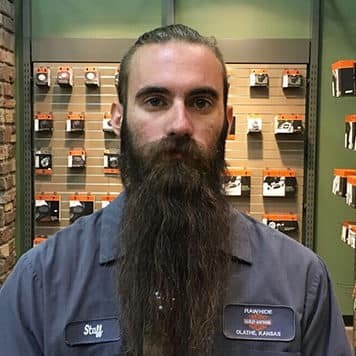 He has been in the Harley Business for about 7 years. He rides a 01 Fatboy, and 05 Road king. When Seth isn’t tinkering in the garage with his bikes, he is probably watching the Royals, Chiefs, or KU basketball. Oh Hollywood! 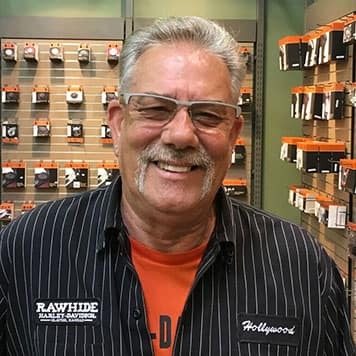 Hollywood has been in the Harley business for 14 years. 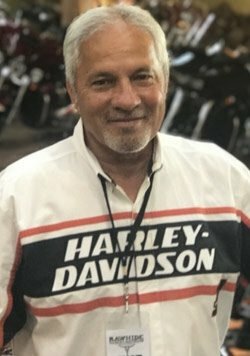 His love of people and passion for motorcycles brought him to the dealership. Hollywood rides an ’87 Custom Sporty. When He isn’t at work having the time of his life you could find him in the outdoors, or cooking in the kitchen! Tony’s hometown is Baldwin City, KS. 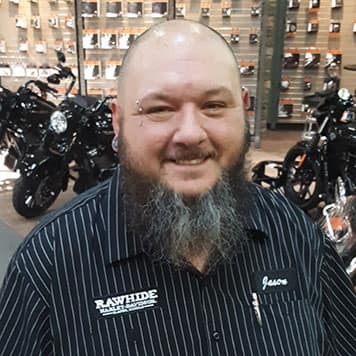 His love for bikes is what brought him to the dealership. He has been riding for almost 45 years! 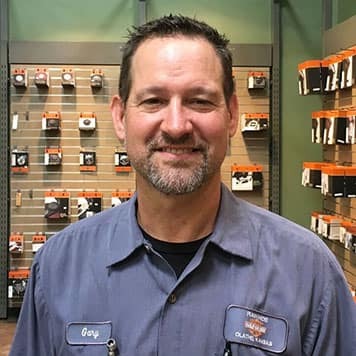 Tony has been in the Harley business for almost 4 years. 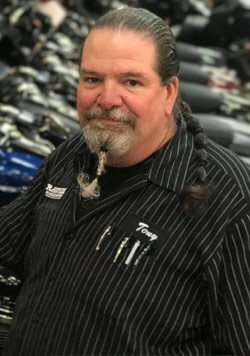 He has four bikes – a ’98 Wide Glide and and ’07 Street Bob, ‘02 Road King and still has his first street bike a ‘66 Triumph Bonneville. Tony is retired from the US Army and has spent 20 years participating in the March of Dimes Bikers for Babies. 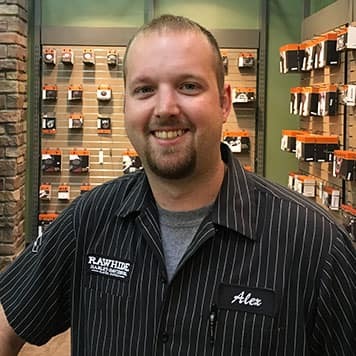 Alex comes from St Joseph, MO and is new to the Harley business. 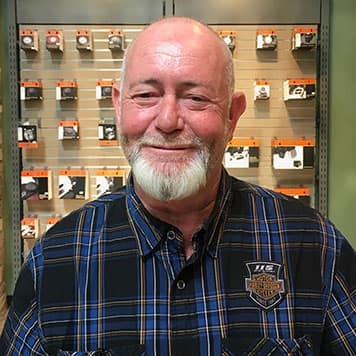 He loves motorcycles and riding, and rides a 1200 Sportster. 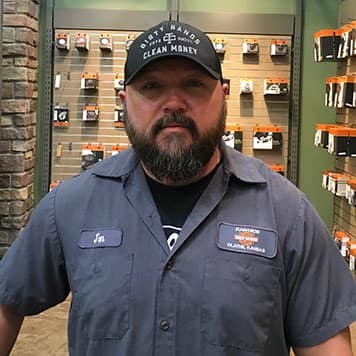 Jason, ‘J’, comes all the way from Nevada, MO and is brand spanking new to the Harley business! He came to RHD through school and used to have a Yamaha V-Star 1300. If you’re looking for someone to pierce that nose or ear, Jason is your man- he’s a licensed piercer!! 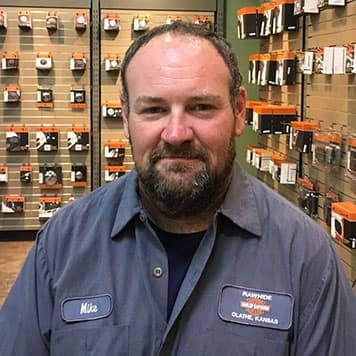 Josi comes from the faraway land of Galvez, Argentina and has been in the Harley business for 4 years. She loves the Shovelhead and likes Assassins Creed. Will hales from Stillwell, KS and has been in the Harley business for 4 years. 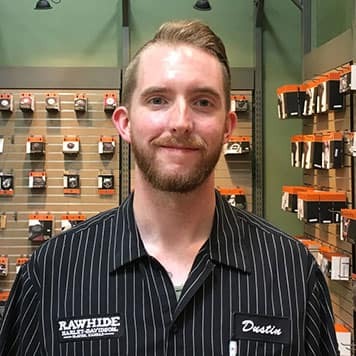 When asked what brought him to Rawhide, he mentioned the people, atmosphere, and the knowledgeable technicians. 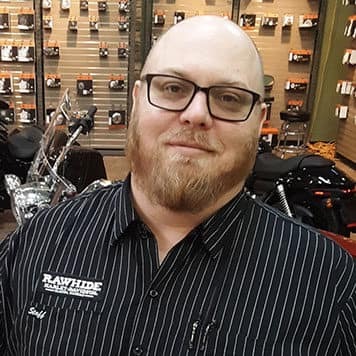 Will rides a 2003 Dyna Superglide Sport FXDX. He attempts to play the guitar and he once tried to backflip a pit-bike into a foam pit. Whether he was successful, and escaped uninjured, is still unknown. Randy is a local to the neighborhood and grew up in Kansas City, MO. He has been in the Harley business for five years now. 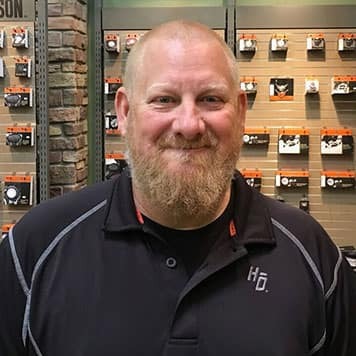 Randy was drawn to the dealership after completing his Harley training School in Fort Scott, KS. 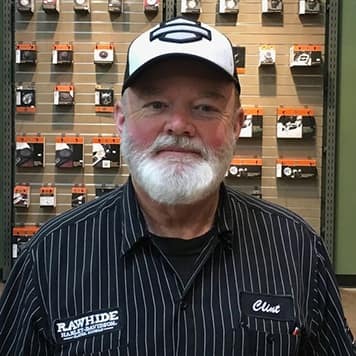 Clint is from Wichita, Kansas and has been in the Harley business for three years. He rides a 2007 Sportster, a 2012 Deluxe, and a 1982 Shovelhead. 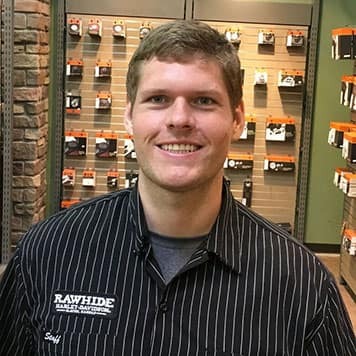 He came to Rawhide because of the great experience he had with our Service department! 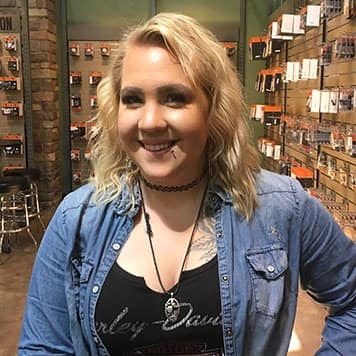 Alyssa comes from right here in Olathe, KS and it brand new to the Harley-Davidson Community. She has been good friends with another employee who works here since Junior High School and came here because she heard it was a great place to work. Alyssa is a sweetheart and will always greet you with a smile on her face. Most people do not know that Alyssa is painter and she has decided to create a website where she can showcase her work. Amy is known around Rawhide as the “Burnout Queen”. You can catch her doing some gnarly burnouts at every one of Rawhide’s Bike Nights. What we love most about Amy is that. 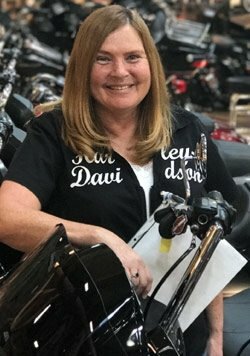 Having lots of wisdom and riding motorcycles for 29 years including racing motocross and hare scrambles, road racing riders school, and drag racing sport bikes she is one of the most impressive women riders on our team . Amy likes to workout; primarily lifting bikes off men that can’t ride. Her main cardio exercise comes from chasing teenage girls away from her two sons. Her full-time job is being an enthusiastic, supportive, and proud wrestling, baseball, and football mom! Gary grew up in Raymore, MO. 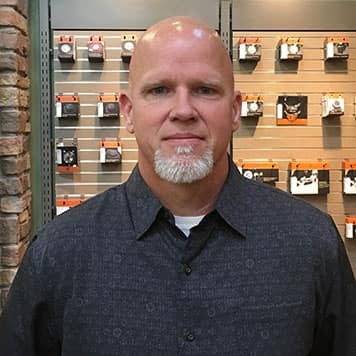 He has been in the Harley business for over twenty-two years! 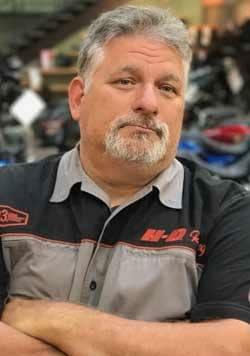 He was drawn to the dealership by his passion for the brand and his love for the motorcycle. Gary rides an ’02 Dyna LowRider. And yes ladies, he is single!! From his humble beginnings in Chanute, KS, Man of many nicknames: Double D, D^2, David^2, Sharky comes to Rawhide from KCMO. He has been a Harley tech since 2002 and he loves the Buell Firebolt XB12R. A fun fact about him is that he is also a local Magician! Harley Tech by day, magic man by night! Bob is from KCMO and has been in the Harley business for 2 years now. He currently rides a Coldwing and is a big Blues music fan! Chris comes to us from Leavenworth, KS and is a big gamer! 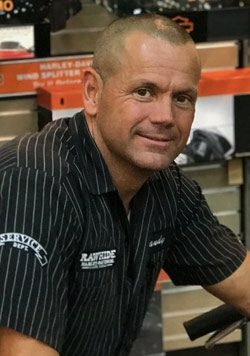 He rides a 2005 Heritage Classic and is just starting out in the Harley business! 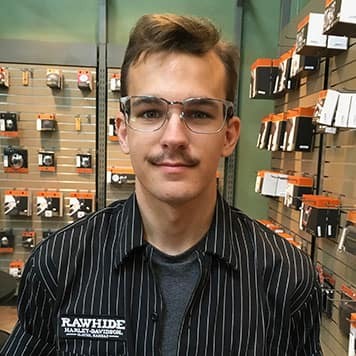 Devon is just starting out in the Harley business and comes from our fair Kansas City. He loves being around motorcycles, and though he doesn’t currently have a bike he likes the Street Bobs best. He used to be a carpenter and enjoys hard work! 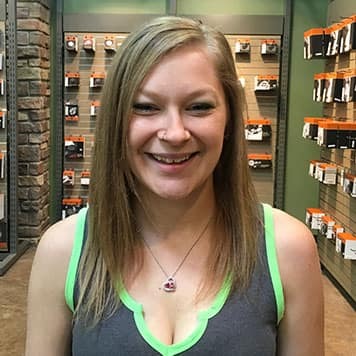 Emily comes to us from Kansas City, Kansas and has been in the Harley business for a year now! She came to us as a customer and never left! She rides a 2014 Ultra Classic. Laurel is from Clinton, IA and started working here because she wanted to ride a bike. She works four jobs, has bought two bikes here and something cool about her is that she goes to a new Baseball Home Opener every year. Kayla otherwise known as Kyle is from Clay Center, KS and comes from a family of riders. Her stepfather and mother encouraged her to get a job here at Rawhide as they are regular customers and thought she would be a good fit. Kayla does not have her own bike but she loves to ride with her Step Dad on the back of his 2016 All Black Street Glide. A cool fact about Kayla is that she was in band and color guard from 5th grade on and loves her son he is her entire world. Camielle comes all the way from the West Coast Portland, OR! 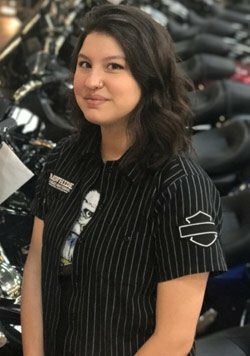 She has worked in the Harley business for about a year and loves the lifestyle! Her favorite bikes are the Sportsters because she is a self-proclaimed shorty. A fun fact about her is that she is into herbs and essential oils. Miss ‘Cam’ is brand spanking new to the Harley business and comes from the wonderful city of Spring Hill. Her dad is in the auto-sales business and that is what brought her to Rawhide. She is a self-proclaimed klutz and once broke about 20 bones in her foot due to an ATV accident. Melody lives in Paola, KS. She rides a 2013 CVO Breakout! Belinda lives in Olathe KS, She was a flight attendant, she now loves to help people learn to ride! 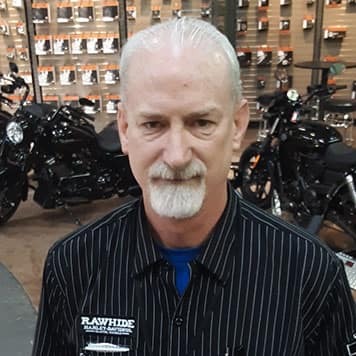 Michael is from Crown Point IN, not only is he a member of our HOG chapter, but has been in the Harley business for 10 years, He has a 18 Road Glide. Also, he has a degree in Insurance! Robert is from Akron, OH, He is a member of our HOG chapter. He rides a 09 Ultra Classic. 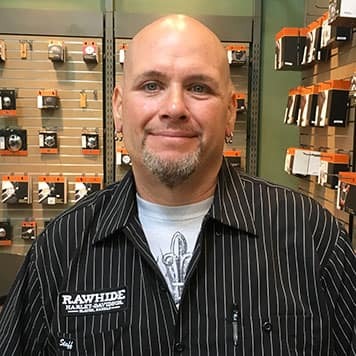 James is from Libertyville, IL, He loves teaching new riders how to ride and introducing them to the Harley family. John’s hometown is Hutchinson, KS. 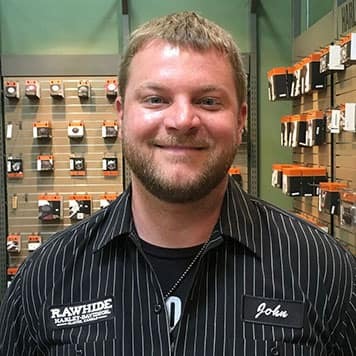 John has been in the Harley business for one year. After a previous position was ending, he went ahead and took over as accounting manager. John rides an ’07 Roadking. In his spare time, John is the director for a youth football league in Johnson County. 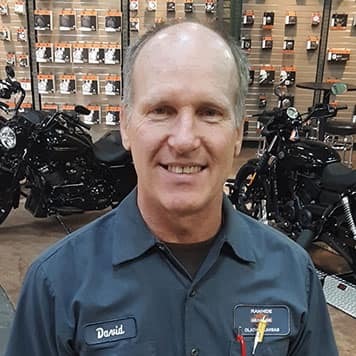 David is from Bradenton, Florida, but he currently lives in Leavenworth, KS. One of his nicknames is ‘Sarge’. 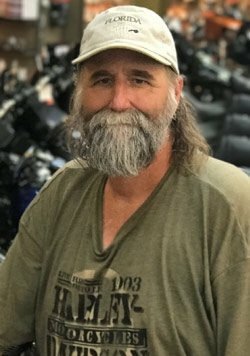 He has been in the Harley business for four years, and has been riding for 35 years. 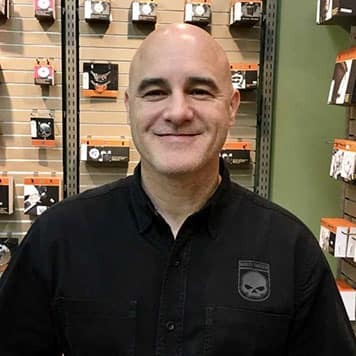 David was in the Infantry for 25 years, and is now retired from the US Army. He rides a custom FXDF. David is an avid photographer, camper and rider. Doug is from Overland Park, KS and nicknamed Penn. He’s been in the Harley business for a little over 2 months now! His friend purchased his bike here and decided not only is this a great place to buy but this is the place I want to work! Doug rides a ’08 Roadking “CVO” Doug’s random fact is that he was a Russian linguist in the Air Force. 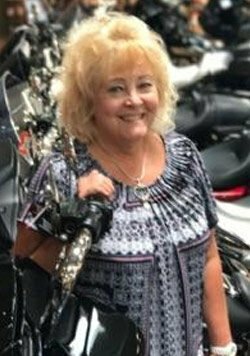 Marilyn comes from Shawnee, Kansas and has been in the Harley business for an incredible 47 years!! She actually used to own Rawhide when it was Central Harley-Davidson!! She used to ride a Tri Glide and actually, Central HD was one of the first Lehman Conversion Kit dealers! Her nephew even built her a Sportster trike and then an Ultra trike! 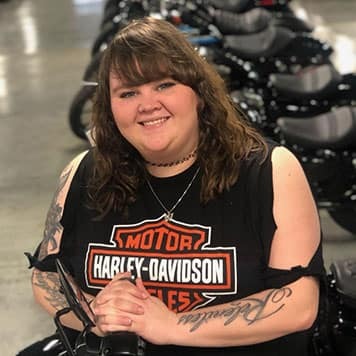 Harley-Davidson flew her out to meet with them about their desire to start building the Tri Glides, how incredible is that?! Kathy is from right here in Olathe! 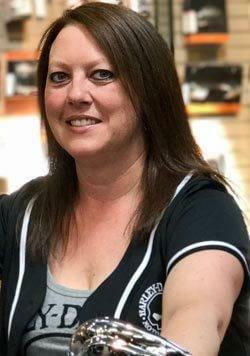 SHe has been in the Harley business for 2 years and she has past experience when it was Central Harley-Davidson at the DMV, and she claims Marilyn saved her from the DMV and brought her on to Rawhide’s fine staff! She likes to ride Harleys, go on cruises, and drink margaritas!! Hannah grew up right here in Olathe and has been in the Harley business for 4 years now. She was given the nickname by Hollywood 4 years ago of ‘Scooter Girl’ or ‘Scooter’ because she used to ride a scooter to work rain or shine! Rawhide is where she got her start in the Harley biz, so she came back home! She trained boxing and MMA under a UFC fighting legend, Todd Medina, for 2 years and loved every minute of it!